village that practices permaculture. And now the cooperative has set its sights on turning all of Helambu VDC into an organic VDC. Permaculture involves the setting up of sustainable livelihood systems that are almost as resilient and stable as natural ecosystems. Permaculture makes use of various natural, technical--even social--aspects to establish farming and other systems that function together in a synergistic manner. In other words, a permacultural farm makes use of an integrated design system that's modelled on nature. To better grasp how this system works, think of how a forest works: nobody digs and sows seeds, plants and weeds, or sprays bugs in a forest, yet the forest thrives on its own--without any human intervention. And if farmers were to just observe how things work in nature, and try to replicate, as close as possible, that design in their gardens and farms, they would not only save themselves a lot of work, but also create highly efficient ecosystems that produce harvests of the highest quality. "To set up a permaculture farm, the most important thing to first consider is its design," says Kapil Prajapati, Secretary of HEACOP. When setting up permacultural systems at Ghang Yul Village, a team of experts from the organisation visited the village and studied the area's weather patterns, topography, soil, water supply, elevations and transport access. All of these factors were taken into account by the experts before the farms were set up. 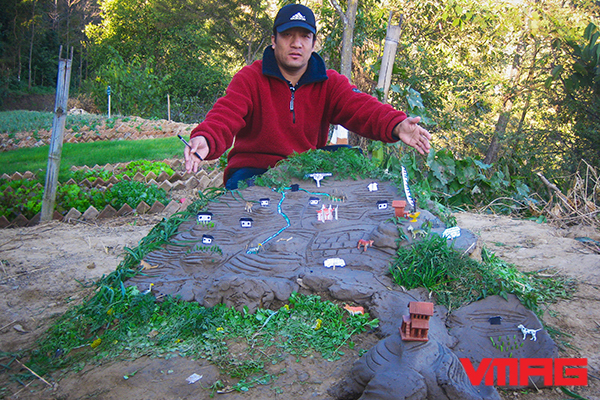 Before beginning the construction of the farms, the HEACOP team first had to convince the villagers of Ghang Yul and the VDC officers to buy into the idea. They did this by conducting workshops in the village; the workshops were attended by both villagers and the areaís political party representatives. HEACOP informed the attendees that besides designing the farms, the cooperative would also create a system for documenting and certifying that the products were organic. Today, these farms, with a total area of around 400 ropanis, produce certifiably organic potatoes, beans, radish and a few other vegetables. Later, in order to diversify the village's produce, Lama and his team at HEACOP started encouraging Ghang Yul's villagers to grow apples and kiwis. They first distributed around 3,000 apple and kiwi saplings, then trained the farmers on organic agricultural methods and orchard management. Those saplings today make up a significant portion of the trees in the village's orchard. 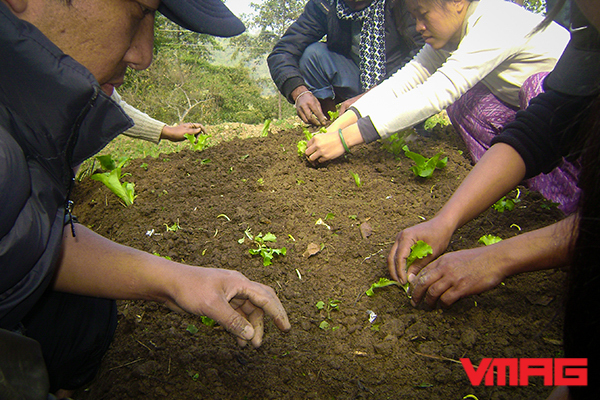 Over the last few years, produce from HEACOP's organic farms have started getting shipped to Kathmandu. Every Saturday, the cooperative sells its products at the organic bazaar in Taragaon Museum. They have even established an outlet, Gorkha Mart, in Boudha, which today sells organic products such as green tea, honey, dairy products and even ayurvedic herbs. And to generate more revenue for the villagers, HEACOP has up with an ecotourism plan--around the idea of promoting Helambu as an 'organic' trekking route. Lama and his team at HEACOP know that sustainable projects are not just about setting up organic farms, but also about providing continual training to farmers. That is why, the cooperative regularly organises various organic agriculture training workshops--in which farmers are given more in-depth lectures about permaculture designs, taught to take care of new nurseries and improve their organic-certification methods and so on. With the success they have found in Helambu, HEACOP's experts have also reached out to farmers in Nuwakot and trained the farmers there to set up organic farms, help with seed distribution and sell their produce at the local kheti bazaars. After the 2015 earthquakes, the cooperative helped set up produce-storage units in Helambu. Today, HEACOP's produce have become the go-to items for consumers seeking organic fruits and vegetables that might as well have been grown by nature--in some forest setting. Because of the efforts put in by Lama and his team, at least 90 per cent of the produce grown in Helambu VDC today are organic. 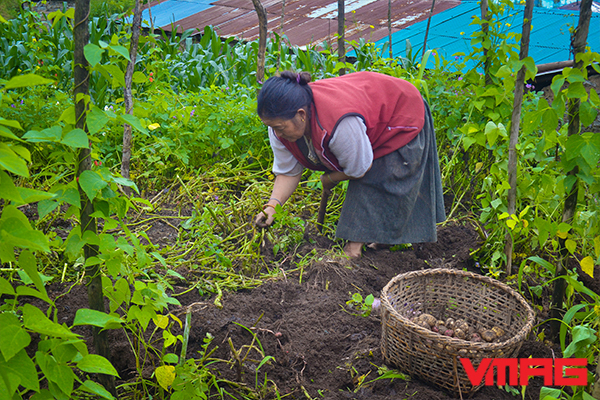 And because of the ready market that the produce have found, more farmers in Helambu have become organic farmers. The way permaculture has been welcomed by the VDC's farmers, it should be only a couple more years before Lama achieves his dream of turning Helambu into a fully organic VDC.